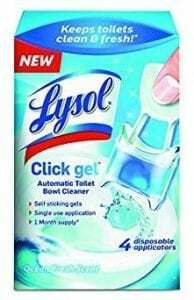 If you’re in need of a scrub-free, low chemical product capable of cleaning your toilet bowl without much fuss, you’ve come to the right place. 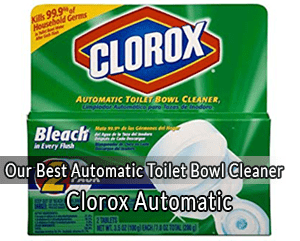 We’re here to show you the best automatic toilet bowl cleaners. An automatic toilet cleaner is expected to remove all sorts of gross residues from your toilet bowl, without needing to scrub things off yourself. All you must do is apply the product and let it work its magic. Toilets are the one place where germs tend to reproduce like crazy, and you’re going to need to keep your toilet clean to prevent this from happening (Source). However, cleaning your toilet manually can be a time-consuming and gross chore. Thankfully, technology has given us the chance to purchase products that help us finish these annoying tasks swiftly and without much involvement. Today we’re going to help you decide which of these products to get. 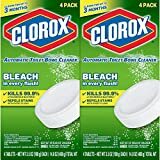 This toilet bowl cleaner is one of the most popular items on the market, and there’s a reason for it: it does an amazing job at removing stains from toilet bowls. This feature is especially effective considering how difficult it is to remove stains even when cleaning a toilet manually. Moreover, it is also very efficient at removing toilet rings. They don’t disappear instantly, of course, but you should start noticing significant results after just a few days of usage. The edges of your toilet bowl should be very clean most of the time once you set up these tablets. The only issue with these tablets is that they leave a barely noticeable odor of chlorine. Additionally, be sure to set everything up properly, or you could cause unnecessary damage to your toilet. Lastly, this cleaner works as soon as you place the tablets inside your tank. You could also use these tablets with specialized cleaning dispensers, but they’re fine if you simply place them in your tank as well. These toilet cleaners aren’t only easy to attach, they’re also very cheap and easy to use. You might need to manually clean your toilet occasionally, but these cleaners do an amazing job at keeping everything tidy for a long time on their own. As a huge plus, the fragrance of the product is very pleasant, too, especially when compared to other products. However, it starts to lose its scent a bit after using the pills for a couple of months. Flushing your toilet quickly rinses everything on the sides and provides an injection of fresh scent into the room. Be sure to place these tablets in an area where there’s enough flow of water inside your tank and they should work wonders in your toilet. If you live on your own, purchasing a single pack might be more than enough to last you for over a year. Meanwhile, if you live with other people, the pack should last for at least 6 months. 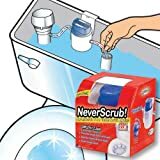 NeverScrub offers buyers a system which can be installed in most regular toilets, working more efficiently than regular toilet cleaners. Although the overall setup might prove to be more tedious, this system minimizes the risk of the pills’ chemicals messing with the inner components of the toilet. This allows the pills to do their job without damaging the rubber inside the tank. However, one issue that you may encounter is related to the length of the system’s tubes. Some toilets might have larger connections, which could render the system useless. If this happens to you, you’ll need to manually create some rubber extensions for the system. On the other hand, this is one of the most effective automatic toilet cleaners on the market. You can apply this system to your toilet and watch it remove traces of mold or any other stain. Just make sure to set up everything properly if you want it to work to its full capacity. The Kaboom system is one of the most popular automatic toilet bowl cleaners thanks to its effectiveness and ease of use. The product itself can be refilled with new pills easily – in fact, non-Kaboom tablets can be used to refill it with no issues. 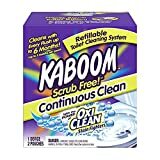 You can even use the Clorox Automatic Toilet Bowl Cleaner pills to refill the Kaboom system. However, the product needs to be placed inside a relatively big tank or it might not fit. You can hang it on the flushing system, but it won’t work as effectively as it would if you properly installed it. On the other hand, the system gets rid of any type of organic residue and bacteria that could be present in your toilet. Scrubbing is not even necessary. Finally, a warning: avoid using this system if your home has a hard water environment. Hard water could prove to be very damaging for the device, and results won’t be effective. 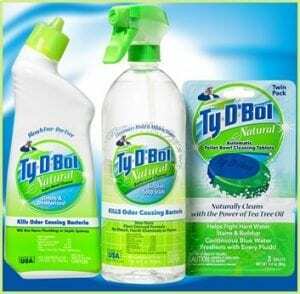 Unlike many other automatic toilet bowl cleaners, this product comes in a bottle. You’re not supposed to put any sort of pill into the toilet tank – all you must do is place the bottle properly and it’ll release the formula when you flush. It does a great job at removing stains and scales from the toilet bowl as well. Notably, the formula shouldn’t damage toilets in any way. Some products contain corrosive chemicals capable of wearing down your toilet with time, but SEABEI’s product does not. It doesn’t leave any residue in the tank either. The liquid is made based on a wide variety of natural components. Additionally, it has a light lavender smell which gets stronger with every flush. Setting everything up is very easy if you follow the instructions provided with your purchase. The bottle is also made to last for at least three months, but it could last longer if you live on your own. Let’s be clear: even if you purchase an automatic toilet cleaner, you might still need to manually scrub your toilet from time to time. Quality products might require you to scrub the toilet only once a month, but lower quality automatic cleaners could force you into manually cleaning your toilet once a week. In any case, we’ve shown you products that qualify as very effective and some that allow you to forget about scrubbing for a while. However, before you make your purchase, we’ll give you a couple of different tips about certain features that your new automatic toilet bowl cleaner should have. All the products that we’ve reviewed today are extremely effective and results show within a couple of days, tops. This is crucial when it comes to toilet bowl cleaners, as ineffective products will leave stains that will need to be manually scrubbed away. The whole point of purchasing an automatic cleaner is to avoid having to scrub your toilet bowl too often. Make sure that whichever product you buy is capable of thoroughly cleaning your toilet with each flush. Having to replace your automatic toilet bowl cleaner once a month is very counterproductive. Whichever product you decide to purchase needs to last at least three months to get the best out of it without having to worry about replacements. If you’re planning to purchase one of the cleaning systems that we’ve reviewed, make sure that your toilet’s tank is big enough for it to fit. Some buyers will end up disappointed if their toilet’s tank is too small to fit the cleaner as they’ll have to manually adjust the system to make it work with their toilets. Some automatic toilet bowl cleaners are manufactured with toxic or dangerous chemicals. These chemicals are not only harmful to your health, but to your toilet as well. Hence, make sure that the product you want to buy isn’t a threat to you or your family by checking out its ingredients and confirming their natural roots. Every toilet cleaner must be designed to fit in almost any type of toilet. However, some are made specifically for toilets of certain lengths. Make sure that the product you want to buy can be adapted to your toilet without any issues. We’ve done our job of informing you about everything you need to know about toiler cleaners before making your purchase. The decision falls into your now-knowledgeable hands, and we know you’re going to make the right call. The products we’ve shown are the five best automatic toilet bowl cleaners on the market. We’ve even given you a budget option. However, even if you’re short on cash, don’t worry. These products aren’t expensive at all and you should be able to comfortably afford most of them. If you’ve already made up your mind, please let us know about your opinion in the comment section below! We’d love to know why you chose one of these products above the others.